omid (mashhad, Iran) on 8 February 2016 in Cityscape & Urban and Portfolio. A nice-looking landscape. Riding a bicycle should express ride quite a long way. Very nice view of this ribbon among the landscape and colours. +1 for cycling here ! Such a beautiful landscape! 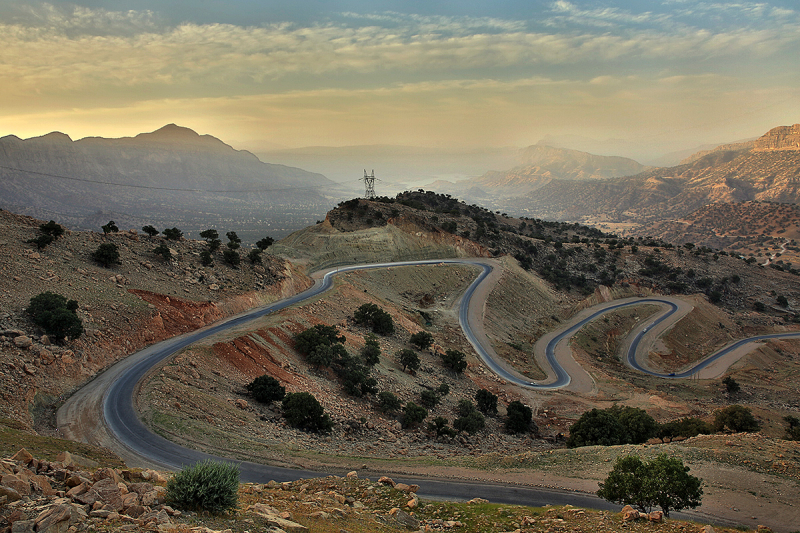 I've seen that kind of road and rocks in Jordan, should definetly visit Iran!!! Lacets de montagne extra ! An engineering challenge for sure . . all but doubles back ! Lovely colors, compo and framing. What a windy road to travel. Stunning landscape view. This stunning view nicely photographed. Wow. A driver's dream--if you like taking corners. Great view ! Thanks for sharing. Nice and peaceful landscape. Is there anybody over there? stunning pano look of this amazing road and the impressive mountains! SIR OMID ...ziba mesle hamisheh. Magnifique serpentin qui se déroule dans un paysage à couper le souffle ! Cela donne envie de voyager ! Magnifiques, la composition et les couleurs ! Great scenery, splendid image, regards my friend !!! Wow that's so striking, well observed. Woww! Theese curves are dangerous!!!! but very nice and artistic landscape! A great curing road from a fine viewpoint. Nice shot. A beautiful image of this serpentine road. Superb light in the scene, too. Masterfully composed landscape. Light and colors are fantastic too. An amazing view! It has quite a dizzying effect! Lots of twists and turns! Looks almost like the Mulholland Highway here in Southern California. Nice composition and point of view. عناصر تو حالت خیلی خوبی قرار دارن یعنی کادربندی خیلی خوبه زمان عکاسی هم ماشالا به سحرخیزی باشد که من هم بتونم از خواب سر صبحم بزنم ! Magnificent landscape, where man has worked hard to build this road! Une route qui ravirait les fans de rallye ! curvas del camino... Lindos tonos y luz.